Don't Renew. Don't Replace. Restore Your Ceilings With The Original Refurbishment Professionals. The Industry Leaders since 1975. Coustic Glo International is the World Leader in ceiling and wall restoration. Formally incorporated in 1975, Coustic Glo began franchising in 1982. Today in markets around the world, Coustic Glo products are proven everyday to offer the correct results and best value every time they are put to the test. We initially began our franchising in the United States and have since then expanded into Canada and overseas markets in South America, Asia, Europe, South Africa, and Australia. Our focus is the cleaning and restoration of all types of ceilings and walls as well as the restoring and repairing and replacement of common defects found in these areas. These problems are found in the interior of nearly every commercial building large or small in existence today. New buildings built today are your customers for tomorrow. Even architects recognize the Coustic-Glo service as being very beneficial and cost saving to building owners. Coustic Glo also offers service to the growing residential market and insurance fire restoration business and works directly with these companies as well as the owners to ensure only the highest standards and quality of repairs is provided. Since the inception of Coustic Glo over 30 years ago our Corporate Vision has always been to offer only the highest quality products and training and conduct our business with the highest morals and ethics. What Can Coustic Glo Do For You? We are ceiling refurbishment experts. Building owners no longer need to spend a lot of time and money to replace their ceilings. The Coustic-Glo products will not only clean and restore the color but also acoustical properties, fire rating and leave the ceiling cleaned and deodorized. Walk through any property and you will see why our business has grown every year. Whether you are looking for an opportunity to build your own exciting and rewarding Coustic-Glo business which will provide you with a quality of life you will be envied for, or you are interested in experiencing firsthand the excellent and cost effective results our services will provide to your building, you will find it all right here. Every direction you look you are seeing a potential customer for Coustic-Glo products and services. Buildings of all sizes and types surrounding us and inside virtually every one of these buildings that you will find the ceilings and walls are being subjected to the wear and tear of daily use. So it is no wonder Coustic-Glo is in such great demand. 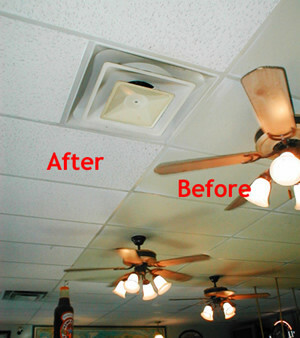 While our primarily business focuses on the cleaning and resurfacing of acoustical ceilings our products allow us to clean and restore many other surfaces as well. 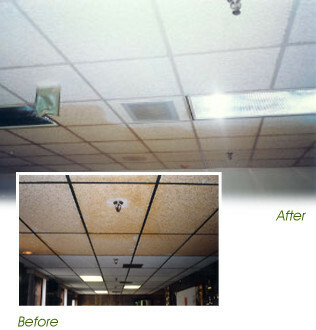 Whether water stains discolor the ceilings, or the discoloration is caused by nicotine from cigarette smoke or common problems from the ventilation system Coustic-Glo products offer an answer.